MoonMarble.com - Topher Reynolds - "Fumed Air Trap Vortex II"
Art Glass → Contemporary Handmade Marbles → Topher Reynolds - "Fumed Air Trap Vortex II"
Handmade marble by Topher Reynolds of Copious Glass. 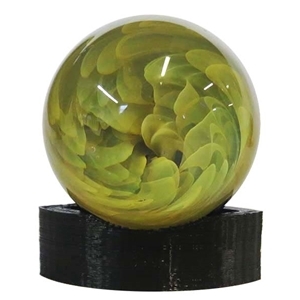 This is a vortex design with ethereal air trap forms spiraling down into the marble. The back is decorated with a tan and aventurine green design. Comes with a stand which is shaped like the Copious Glass seeing eye logo. Approximately 1 3/4" in diameter.